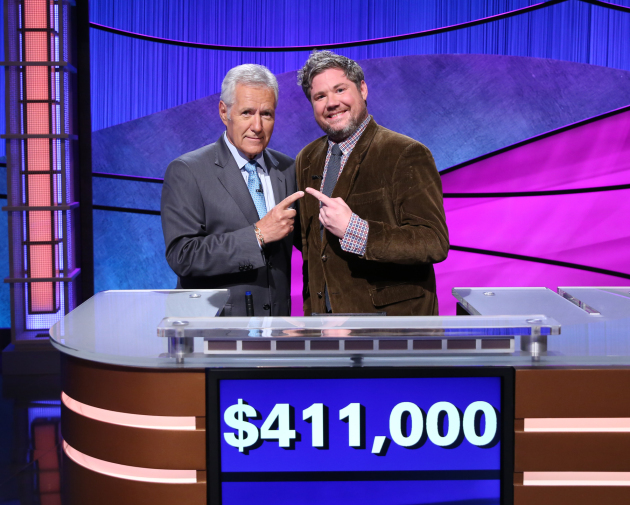 Watching Austin Rogers high-fiving and clapping wildly at the end of Thursday's episode of "Jeopardy! ", you would have assumed the Macalester College grad had extended his winning streak to 13. The reign of the former St. Paul student, currently a New York bartender, ended after 12 episodes and $411,000 in winnings. Only four contestants in the show's history have won more games or more money. Scarlett Sims, a mom from Tennessee, ended up with $33,201, enough to inch out Rogers' $33,150 for the upset. Sims took an early lead thanks to her deep knowledge of pop culture, cleaning up on a category about fellow Tennesseean Dolly Parton, and mistakes by the now former champ who blanked a couple of times after buzzing in and blew an early daily double when he failed to recognize a sculpture of a musk ox, which just happens to be host Alex Trebek's favorite animal. “I set myself a goal of two wins, and I exceeded that expectation,” Rogers said in a press release. “I mean, I always wanted validation that I’m smarter than everyone, and now, when in an argument, I can just say ‘SCOREBOARD!’ and point to an imaginary Jumbotron." Rogers will have a chance to add to his fortune, though; he's already qualified for the show's Tournament of Champions, which airs in November. "Jeopardy!" airs locally at 4:30 p.m. weekdays on KARE, Ch. 11. No matter how he does next month, Rogers will certainly go down as one of the show's most eccentric contestants.